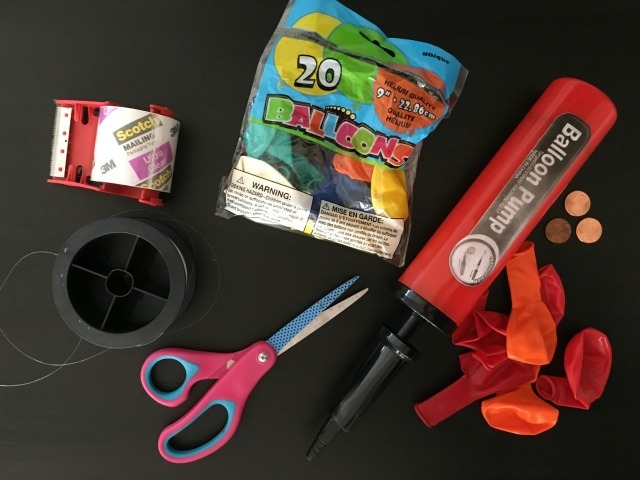 Party Balloon Decorations - C.R.A.F.T. It was birthday party weekend extravaganza in casa de Dorobek. 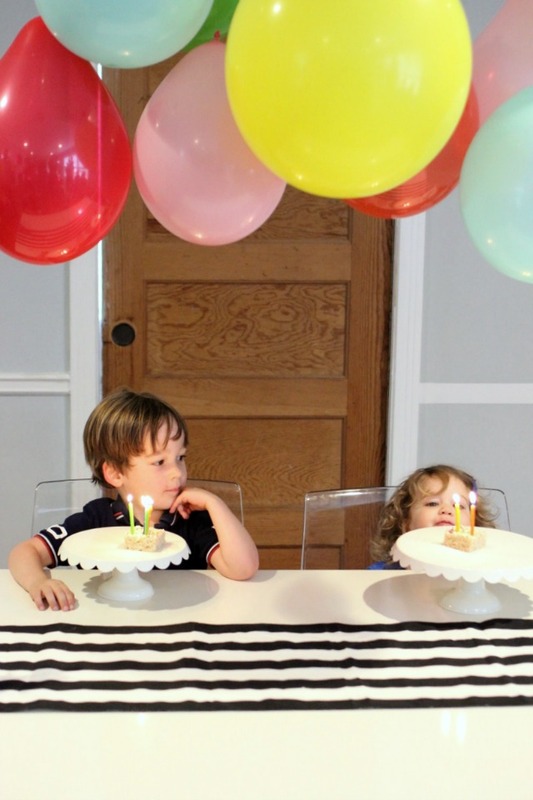 I feel fortunate that my kiddos were both born in March and I can get away with throwing one party for 2 kids! 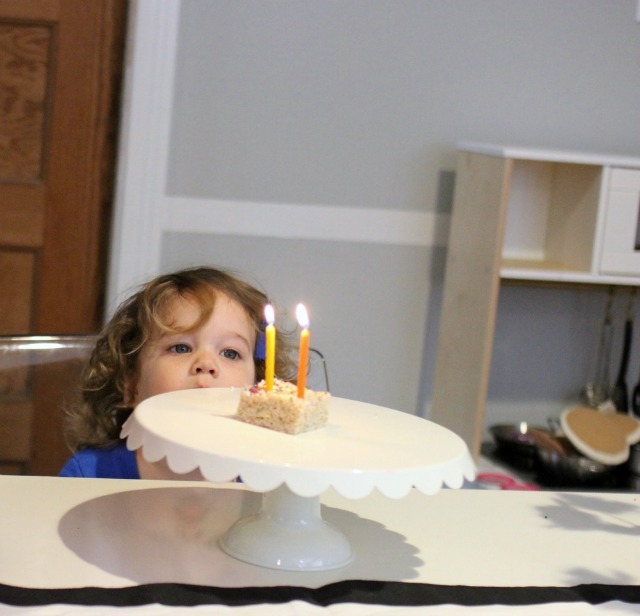 We keep the birthday party thing as simple and low stress as possible including no presents, breakfast food, and evites. Here’s a run down of past birthday parties. Maxwell’s first birthday was party animal themed and the only real themed party I’ve ever done. It was supposed to be at a park, but with 100% chance of rain on party day, it was moved to an indoor location at the last second. I sent out fancy invitations and handed out party favors. We also allowed presents that year, but I’ve gotten smarter and learned a thing or 2 about kid birthdays. Maxwell’s 2nd birthday ended up on the top pf parking garage. We only invited close family members. Sweet Mila was only 2 weeks old, and it was all I could handle in the moment. Maxwell had a blast, and the parking garage birthday party ended up being absolutely perfect. For Maxwell’s 3rd birthday and Mila’s 1st birthday, we did a breakfast bash at a local joint called Hat Creek. 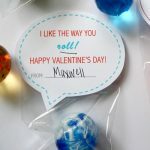 Morning time ensures my kiddos are in good moods, the playground is built in entertainment, and the helium balloon decorations turned party favors ended up being such a hit, I did that again this year! 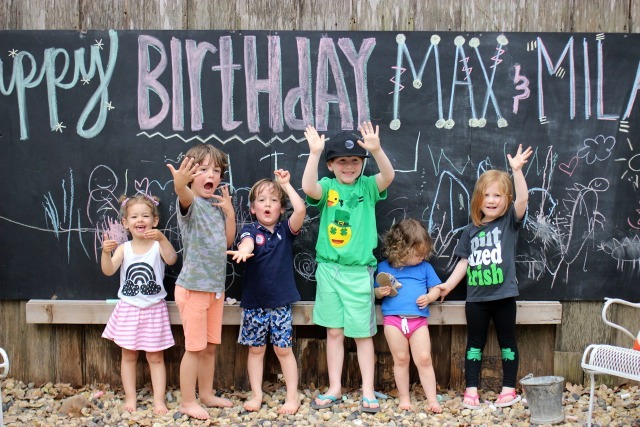 For the 4th and 2nd birthday, Maxwell was super excited about the idea of friends coming to his house. So, I gave in, and we hosted 44 people at our house. Luckily the weather was amazing, our backyard is already set up for little kids, and we rented a bounce house! 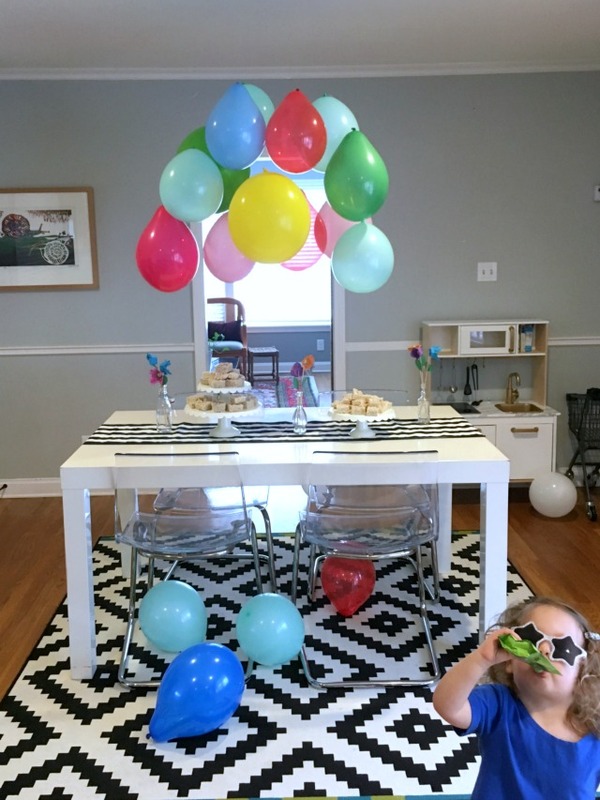 I’m sharing all the birthday party details in including how to make a balloon chandelier, our super simple menu, and pro tips for throwing a fun, easy, stress free backyard birthday party for toddlers and preschoolers. This post contains Amazon affilate links. If you purchase something I recommend, I get a small commission at no extra cost to you. As you can see in the picture above, the only decorations I used inside was on our dining room table. I threw one of my trusty black and white table runners and added a few small vases of egg carton flowers. I’m a dork and keep a huge bouquet of these in a kitchen cabinet. The egg carton flowers are a craft from my book, and much like the table runners, they get used often. In addition to that, I decided to get crazy and make a DIY balloon chandelier. 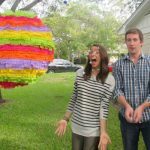 It was so easy and inexpensive, I am absolutely adding this to my party decoration repertoire! The first thing you need to do is decide on a color palette. I went with the color of balloons I had on hand, ha! But, next time I make one, I will be more strategic with my balloon color choices. This jewel tone pack of balloons on Amazon is perfect and a good deal. 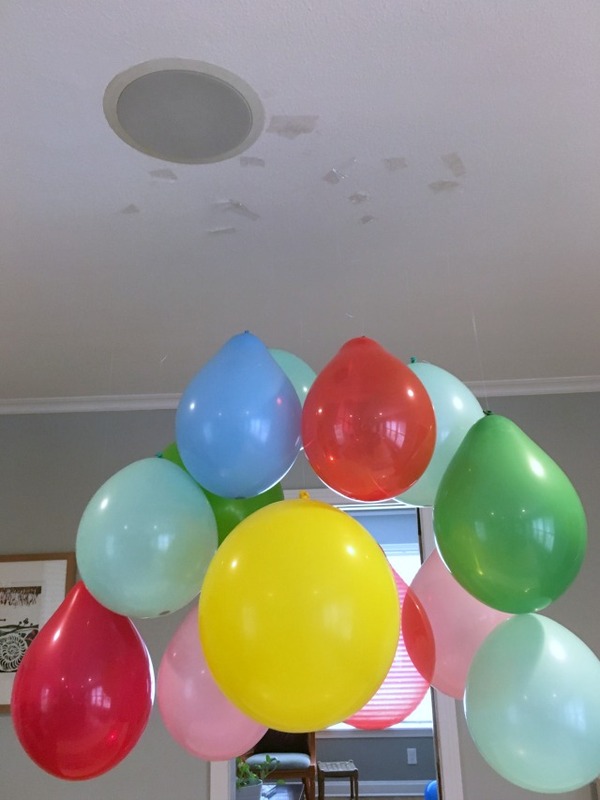 To make the balloon chandelier, first insert a penny into the balloon. Then use the balloon pump to pump air into the balloon. Tie the balloon off like normal and then tie fishing line around the knot. Use packing tape to tape the fishing line to the ceiling. Repeat this for each balloon in your balloon chandelier. I used 11- 9 inch balloons and 2- 12 inch balloons. (The yellow one in front and the green one in the back are 12 inch balloons.) I like the big and small balloons together, but I think the balloon chandelier would still look awesome with only 9 inch balloons too. The clear packing tape did its job pretty well. I hung the balloon chandelier the night before the party and that morning, 2 balloons had fallen. I reattached with more clear packing tape and it held up perfectly for the birthday party. Mila especially loved the balloon chandelier and insisted on touching it as often as possible. Pro tip: The penny is crucial. 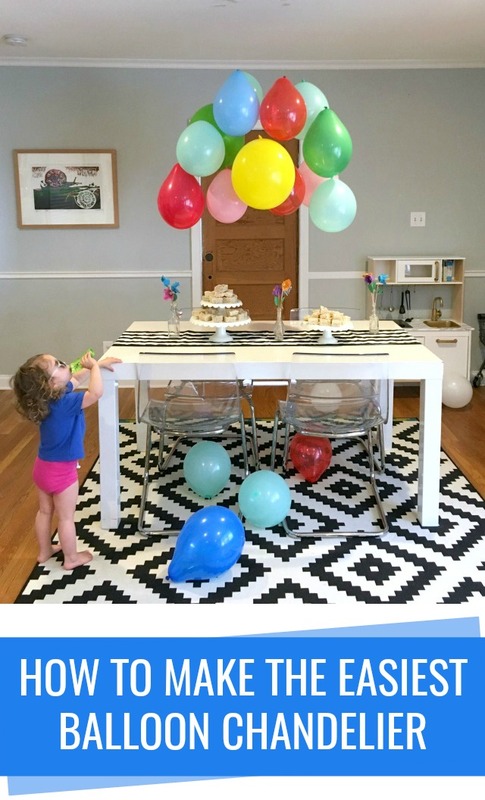 If you don’t add the penny the balloons will not hang upside down properly. Since it was a breakfast birthday, we decided to make rice krispie treats in place of cupcakes. 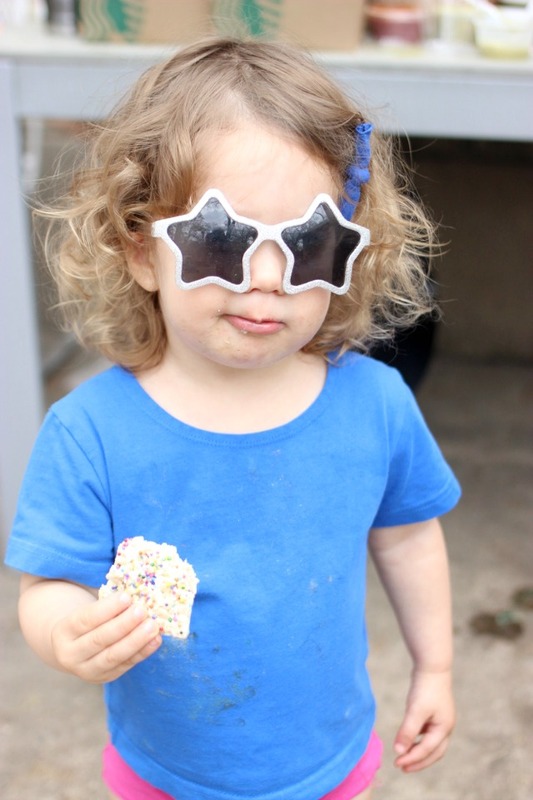 It worked out great since Maxwell loves to help make and eat rice krispie treats. All of the food except for the rice krispie treats was outside. 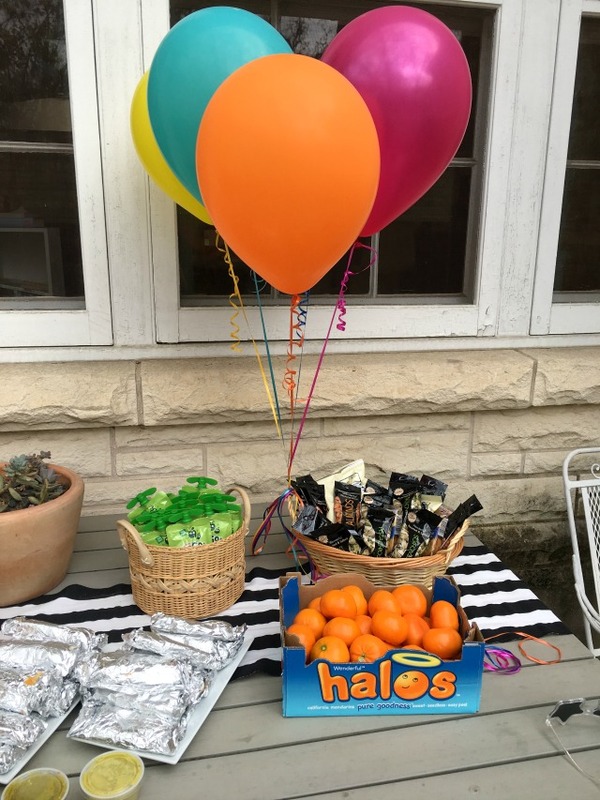 The breakfast birthday party menu was breakfast tacos for the adults and my kiddos favorite, special snacks. 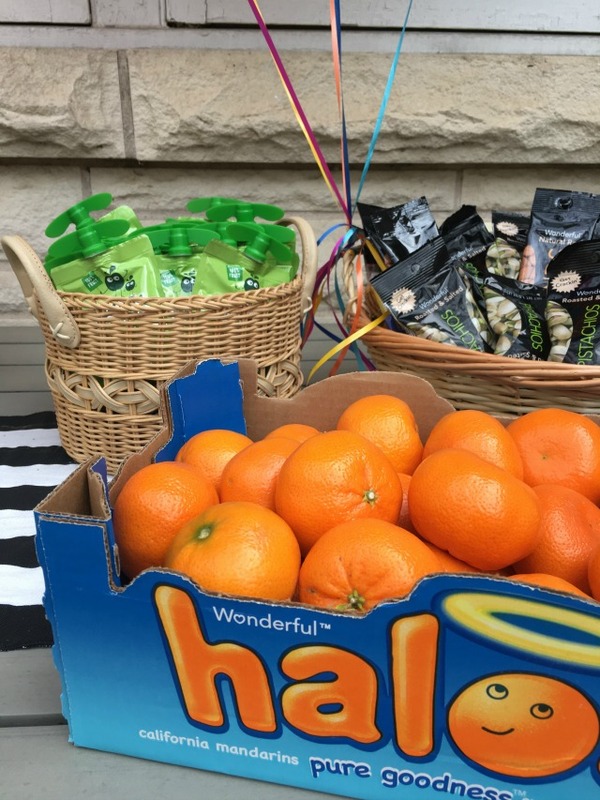 My kids do not get a lot of pre packaged snacks, so it was extra special to have a big basket of snacks that were basically free for the grabbing to all the kiddos. I was super lucky on the picture note since I took very few during the actual party. 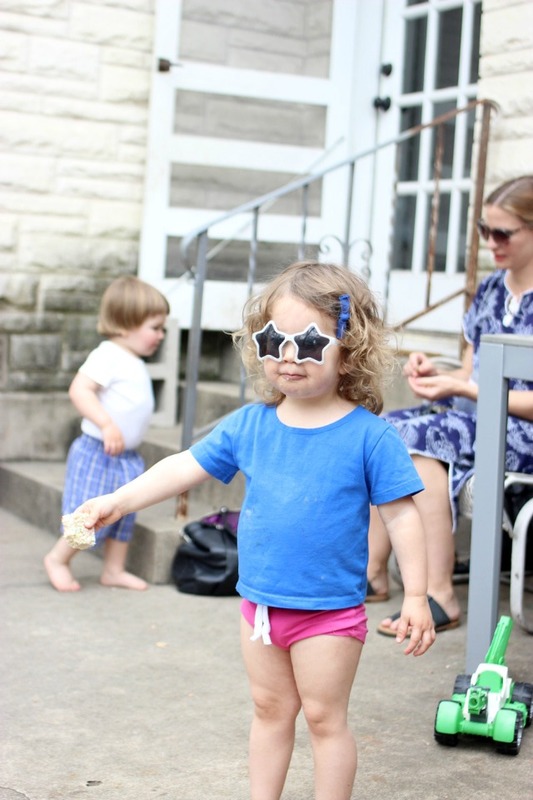 But, my bestie Annie who runs a cute small shop called Slinky and Moose, came prepared with her fancy camera and got lots of cute shots, including this one of sweet Mila. Pro Tip: Give someone the job of taking pictures at the party so that you can enjoy your kiddos and hang with the guests. I love that I only took a picture of half of the food table set up in the backyard. This was the cute half, the other half had coffee, plates, cups, and napkins galore. Pro tip: Make sure you have a trashcan set up nearby. We put one under the food table. 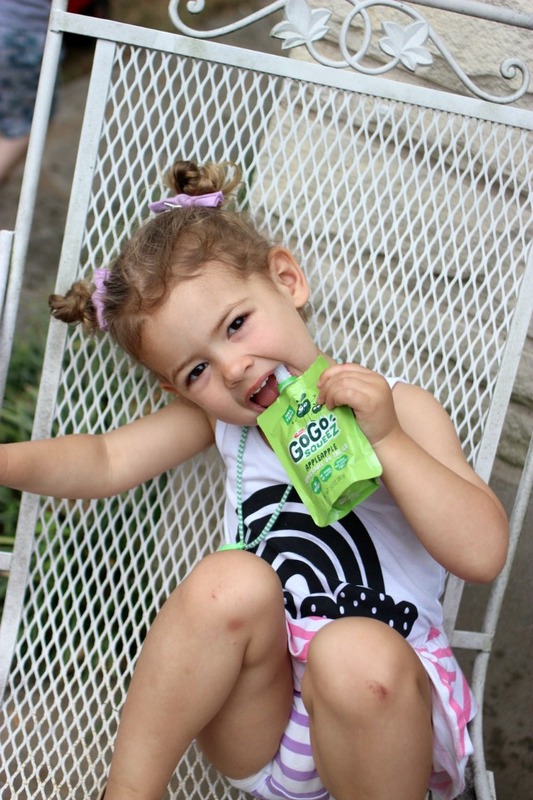 This is Annie’s cute daughter enjoying a Gogo Squeeze! We use our backyard everyday, so with the addition of the bounce house we have built in stations to encourage activity. 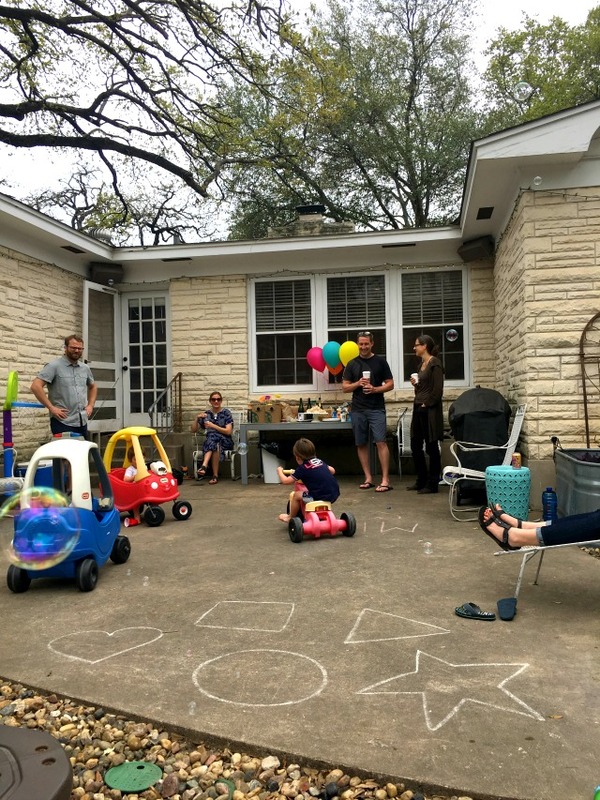 Our cement slab is perfect for vehicle riding, the garden below is set up for digging, the giant outdoor chalkboard was perfect for coloring, and of course, the bounce house for bouncing. 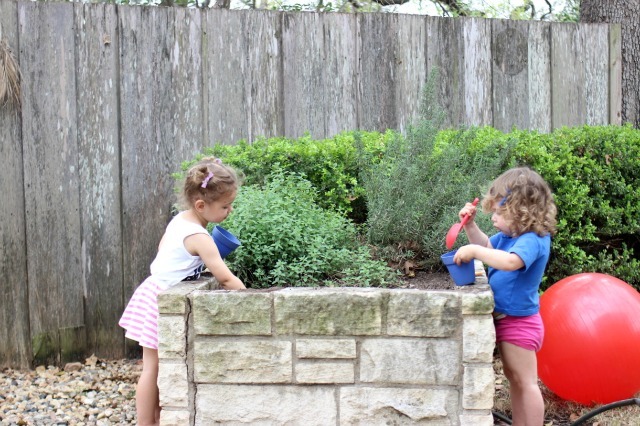 Pro Tip: Set up simple stations in the your backyard to entertain the kids and allow them to go from one thing to the next at their own pace. 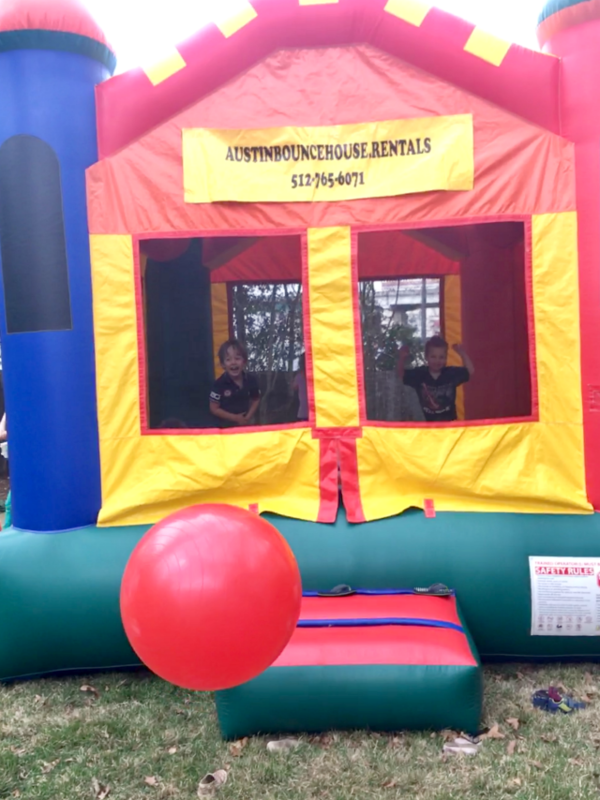 The kids loved having us throw bouncy balls at the bounce house, ha! I’m not sure who started that shenanigans, but they loved it. 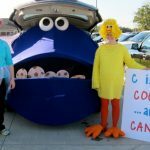 We sang the kids happy birthday inside, handed out rice krispie treats, and went back out side to play! The balloon chandelier made the pictures extra festive. I love how Mila wanted to sit on the chair just like Maxwell, and her little head barely peeks over the table. I wish I would have insisted on taking a picture of all of the kiddos at the party. But, I’m happy I got this cute crew before the party ended. One more fun birthday party tid bit, we bought a bubble machine, and Andy rigged it to the eave of our house so that it could be hooked up to a light switch. I’m excited to have to for future use! I caught a bubble in the picture below. This is the bubble machine I ordered on Amazon. 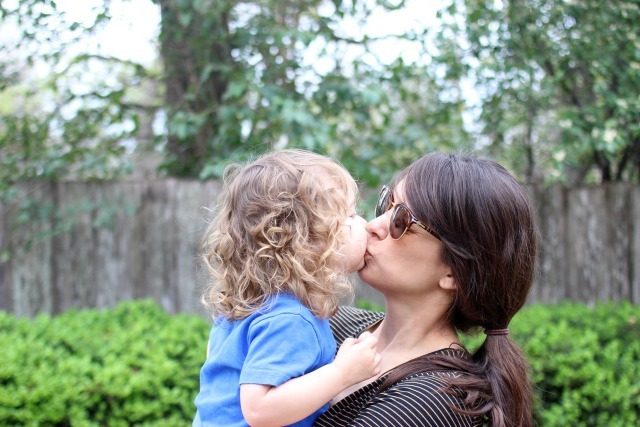 The backyard yard bubble, breakfast, and bouncing birthday was a success! 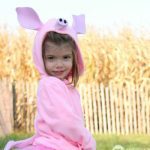 I’d love to hear your best tips for backyard birthday parties for kids. Looks so great! I love how simple and easy the idea is, but makes the room vibrate with joy! This looks like such a fun party! I love the balloon chandelier! Great ideas, I can’t wait to try them out! Simple and elegant. It is quick and easy to make, for small celebration it is perfect.